Buffalo soft leaf (such as Sir Walter DNA Certified) – perfect for homes in full sun or shade. It’s low maintenance and soft for kids to play on. Couch (such as Queensland Blue Couch) – perfect for full sun areas and hard wearing, making it ideal for high-traffic and sporting areas. Kikuyu – fast growing so perfect for large areas where you need rapid spread. 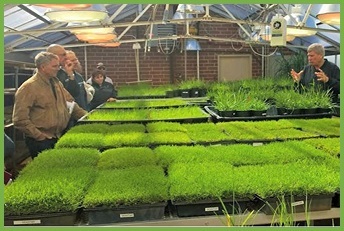 Differences in cost, in large part, stem from the amount of time your turf lawn needs to be nurtured on the turf farm before it is ready to harvest, deliver and install. The less expensive turfs tend to be those that are fast growing – they cost less time and money from the planting to the harvesting phase. And the opposite is true – a slower growing lawn which takes longer to reach harvesting costs more in time and money before it can be delivered to you. Which lawn variety is right for you? The beauty of today’s turf market is the choice – you have so many options available you can choose the lawn type that is right for you, how you plan on using the lawn, and the location. Choosing a lawn type which is right for your lifestyle, and not based solely on price, is always the best advice and will end up saving you money in the long term. High maintenance lawns require more mowing, tend to be highly invasive and cost you more in time and money. Low maintenance lawns require less work which saves you time and money. Our best advice is to seek advice from your local, accredited turf farmer, like us here at Harden Park Lawns. We understand lawns and can offer accurate information so that you can make a fully informed, cost effective decision for your new lawn and the life of that lawn. « How much does a new lawn cost?